When Eiffel 65 released ‘Blue (Da Ba Dee),’ it was a flop. They sold around 200 records, shrugged it off as a loss, and forgot about it. But in a wild turn of events, the track got picked up by a small local station before getting airplay on one of the biggest radio stations in Italy—and within days, it was steamrolling its way to becoming one of the biggest hits of the late 1990s, taking the electronic music group touring around the world as their song shot up the charts. 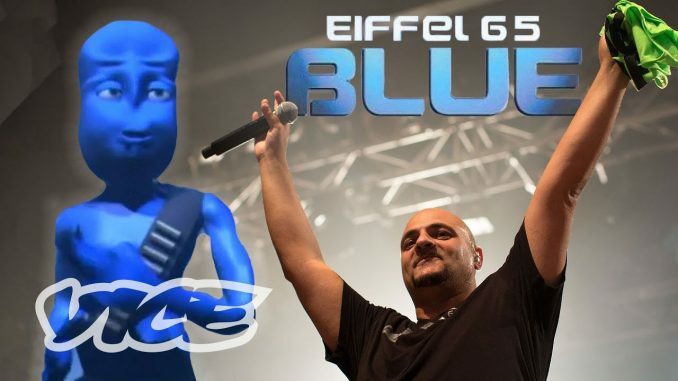 We met up with the members of Eiffel 65—Jeffrey Jey, Maurizio “Maury” Lobina, and Gabry Ponte—to find out the origin story behind “Blue,” and hear what it was like to become international superstars in the blink of an eye. Eiffel 65 is an Italian music group consisting of Jeffrey Jey, Maurizio Lobina and Gabry Ponte. They gained global popularity with their hit singles “Blue (Da Ba Dee)” and “Move Your Body“, from their 1999 studio album Europop. The singles reached number one in many countries, while the album peaked at number four on the Billboard 200 chart. Their following two albums, Contact! (2001) and their 2003 self titled album did not gain that much success, but still managed to gain success in Italy. Over the course of their career, the group won a World Music Award in 2000 for the World Best Selling Italian Group, and a B.M.I U.S.A in Los Angeles, rewarding the most-broadcast song on radio in the United States. They were also nominated at the Grammy Award for Best Dance Recording for “Blue (Da Ba Dee)”. Europop was crowned as the greatest album of the 1990s by Channel 4. Eiffel 65 also composed remixes of numerous popular songs, and they recorded “One Goal“, one of the official songs of the UEFA Euro 2000, and “Living In My City”, for the 2006 Winter Olympics. With more than 20 millions of copies sold and many gold, platinum and diamond records, Eiffel 65 is one of Italy’s most popular electronic groups.